Of course, I’ve always known about soup. I’ve been eating it my whole life. 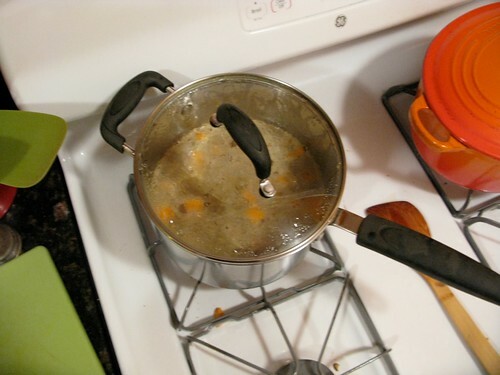 But what I didn’t know is that of all the things you can cook in your kitchen, soup is the dish that allows for the most poetic license: you can literally boil shoes in water until they’re soft, whir them in a blender and you’d have soup. 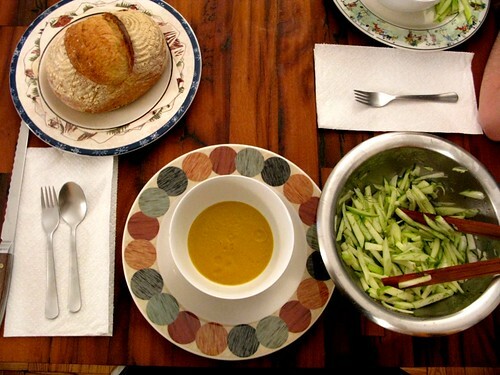 And so now I’m a soup-making fiend: at a dinner party a few weeks ago, I whipped up a fennel onion soup (from “Roast Chicken & Other Stories”) that was such a cinch to make and so comforting on a cold winter’s night, I was hooked. And what I’m loving now about soup (as you’ll see with the sweet potato soup ahead) is how easy it is to improvise: how if you have an onion, any other vegetable (broccoli, peas, carrots, turnips), and a box of stock (chicken or vegetable or even just water), you can turn out a delicious soup in no time. And fooling around with spices and other aromatics, you can really make the soup your own. 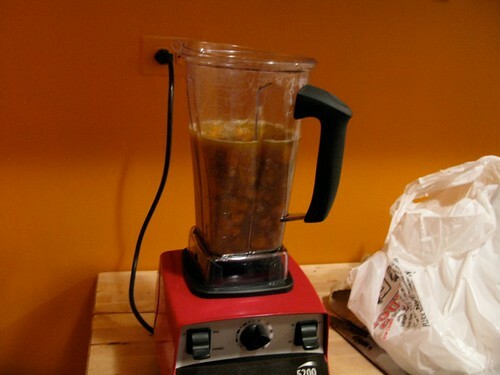 It helps that, a few months ago, I was sent a free VitaMix blender (yes, this stuff really happens to bloggers). I felt a little funny about it, this being a major kitchen appliance, so I kept it in the box; but only recently did I break it out. 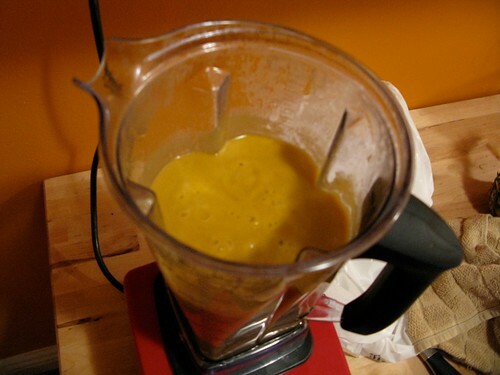 And I’m really glad I did, because this blender is a kitchen superstar. It blends things up with a vengeance and the soups I’ve made with it so far are so incredibly smooth, you don’t even need to strain them. Plus you have lots of control over how fast it spins, so you can start out slow and build to warp speed. It’s not only a fun toy to play with, it’s incredibly useful. 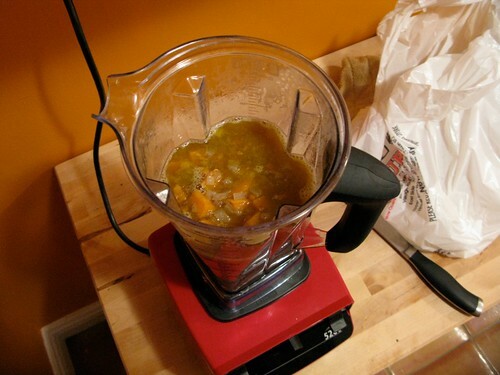 It’s because of this blender that I was inspired to invent a soup of my own. After my recent epiphany about food shopping (see here), I had a refrigerator filled with potential soup ingredients. 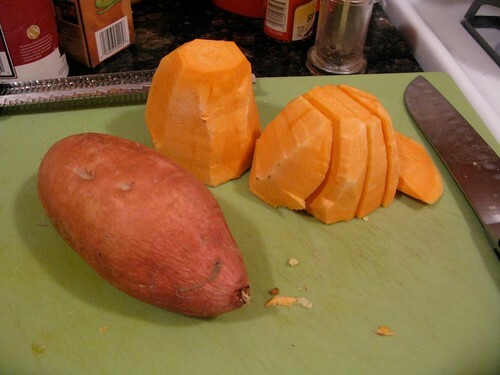 I settled on sweet potatoes. 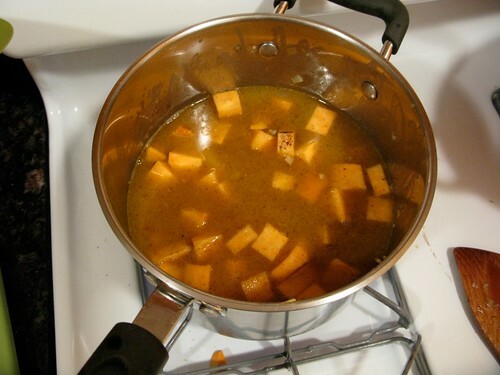 What follows is my first truly improvised recipe–a splash of this, a pinch of that–that results in a pretty killer soup. I dare you not to love it. Before we get to cooking, though, I have some exciting news: I’ve convinced the good people at VitaMix that if a putz like me gets a free blender, you should get one too. So they’re donating a brand new VitaMix 5200 blender to one of YOU lucky readers. This blender, according to their website, has a value of $565.00 (though they sell it for $450) and it’s the blender you see them using on shows like Top Chef and Iron Chef. You know you want it. So here’s how you win it: share your favorite soup recipe in the comments. It can be someone else’s recipe, your own recipe, or one that you make up as you type. I’ll choose the ones that appeal to me the most, test them out in my kitchen, and invite a few judges over to help me pick the winner. The winner will be revealed in a post next Friday, January 29th. You have until this Monday, the 25th, to share your recipe. Make sure to include your e-mail address with your comment so I can contact you if you win! 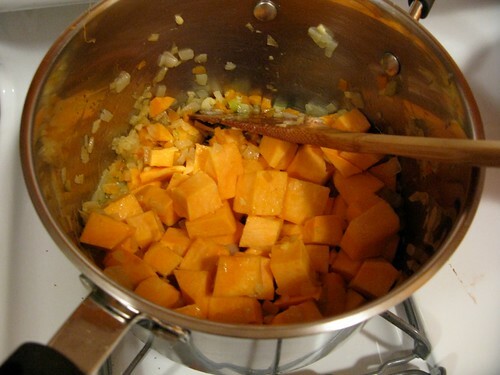 As for my winning recipe, here it is: spectacular sweet potato soup. You’re going to love it. 1. 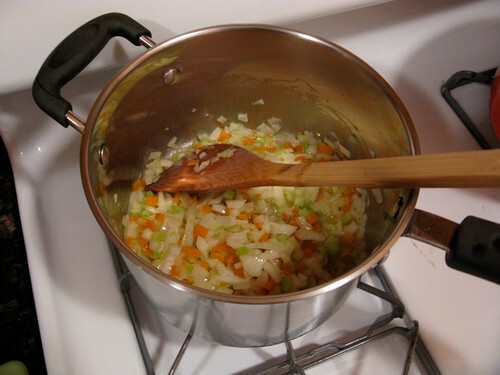 Chop up one onion, two carrots and a stalk of celery. 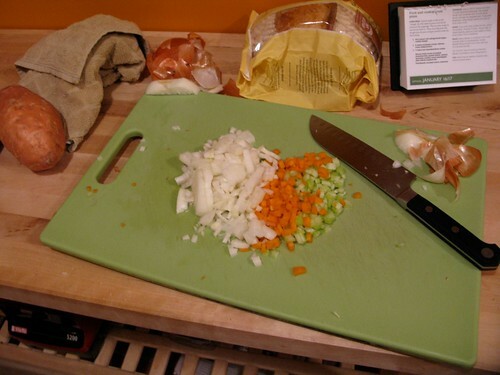 If you don’t have carrots or celery, just chop up an onion. I’ve made this with just onion, and it totally worked. 2. In a pot, melt 2 Tbs butter with 2 Tbs of olive oil on low/medium heat. 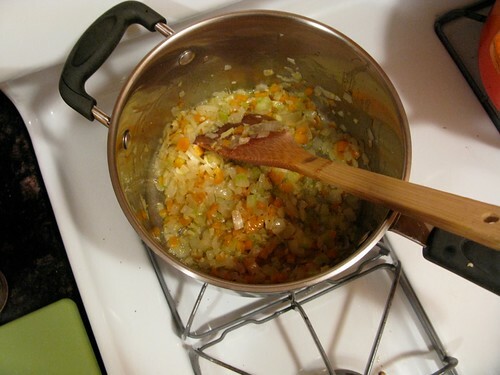 Add your mirepoix (that’s the fancy name for the combo of carrots, onions and celery), a big pinch of salt, and cook–again, on lowish heat–for 20 minutes. It shouldn’t change color; it should just sweat and the onions should become translucent. 3. 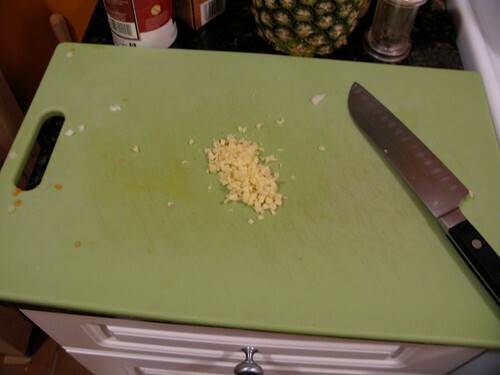 Chop up a knob of ginger. More ginger if you like a lot of heat, less if you like it mellow. 5. 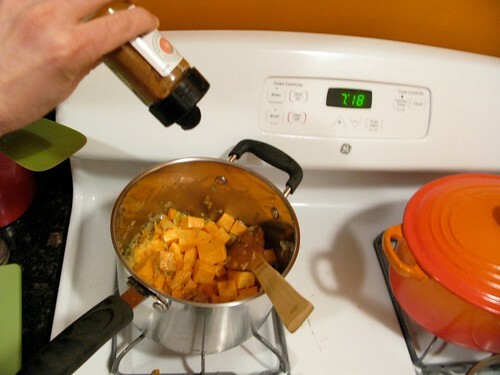 After the 20 minutes are up, add the ginger, and cook a few minutes more. 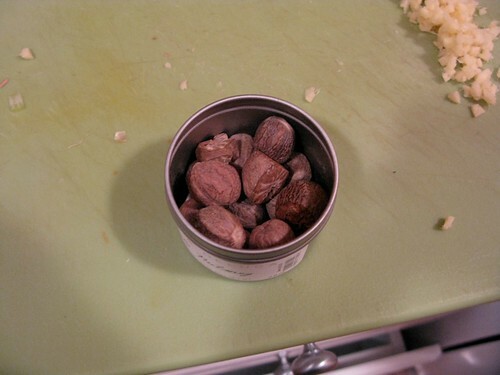 I also added a pinch of cloves and allspice and more salt. This is where you can improvise and feel free! But if you’re going with pie spices, keep that consistent; I wouldn’t add garlic or smoked paprika after adding cloves and cinnamon. 10. Now you add the final ingredient: stock. I’ll be honest, I use chicken stock from a box. I think it works great. 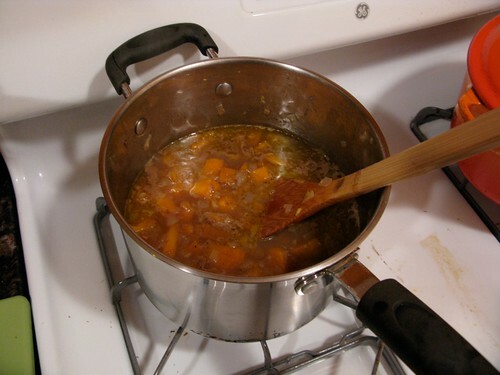 I know some food writers advise using water rather than stock from a box, but I like the viscosity of chicken stock and I think it makes the soup richer; if I had homemade chicken stock, of course I would’ve used that, but I didn’t have it on hand. Anyway, add enough stock to cover everything in the pot. Don’t go crazy with it: you can always add more later to thin it out. 11. Add a bit more salt (taste for seasoning), bring to a boil, lower to a simmer and cover. 13. 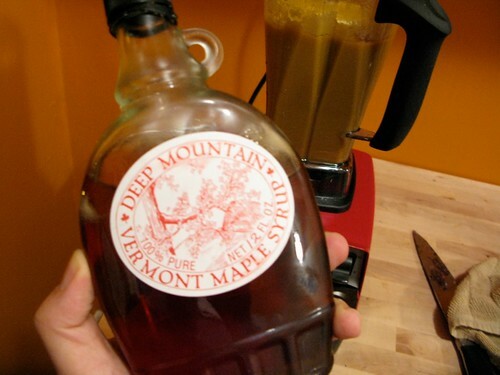 Here’s the fun part: pour it into a blender. 14. Put the lid on but keep the hole open (otherwise it might explode) and cover with a kitchen towel as you blend your soup. 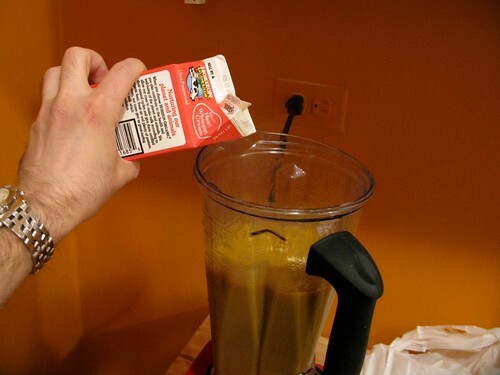 Let it blend for a good minute, you want it extra creamy. Just add it to taste (this is the point where you should keep tasting and tasting and tasting, it’s easy to adjust it to make it even better). And that, my friends, is my spectacular, improvised sweet potato soup. Now it’s YOUR TURN. Do you have what it takes to win your very own VitaMix 5200? Share your own spectacular soup recipe in the comments.